Earlier today in Nantes, France, two women—three women really–actually came to blows over the burqa. The burqa wearer (actually, the niqab wearer), claims that she heard two women, one a 60-year-old lawyer, make "snide" and "insulting" remarks about burqa wearers. The lawyer and her daughter claim that the burqa wearer physically assaulted them. After which, the lawyer ripped off her veil. One thing is clear: The shop manager and the burqa wearer's husband "moved in to break up the fighting." Everyone was arrested. Of course, the burqa wearer has filed a complaint for "an insult of ethnic, racial, or religious character"; the lawyer and her daughter have filed a complaint for violence. Both narratives are entirely plausible. Many Westerners are not comfortable around burqa wearers, do not want to see them, and fear that they represent a hostile fundamentalism that does not respect Western culture or values. Worse: Burqas are also connected to militant jihad against Western civilians. Many Muslim and ex-Muslim feminists, as well as secularists and feminists of all faiths, view the burqa as a violation of women's rights and as a serious health hazard. I have written about this HERE. Others, including Daniel Pipes, view it as a security risk—homicide bombers and bank robbers may be hiding under that face mask or full head and body covering. Europe is on fire over this issue, this symbol of jihad. Algerian-American Marnia Lazreg and Tunisian-French Samia Labidi do not believe that the Islamic veil is a religious requirement. Egyptians Nonie Darwish and Tariq Heggy remember when there were very few veils in Egypt and mourn the passing of a vibrant modernity and feminism in their country. Could the woman in Nantes who wore the burqa have imagined that she was being insulted? Or did she hear correctly? Europeans did behave in racist ways when they reigned as colonial powers. Their racism continued when they allowed large scale immigration from their former colonies into Europe for venal economic reasons. Now, the European pendulum has swung in the opposite direction. Europeans treat "racism" or even "allegations of possible racism" as crimes; Europe is the multi-culturally relativist capital of the world. Until quite recently, Europeans have refused to condemn polygamy, child marriage, forced marriage, honor killings, female genital mutilation, and burqa wearing. They view these practices as "cultural" or "religious" rights—which, when practiced by people who are dark-skinned, might lead to charges of "racism" were such human rights violations condemned, especially by Caucasians, or by former colonial powers. Nevertheless, Sarkozy has called for a ban on the burqa. One of his allies recently received "death threats" over this possible ban. 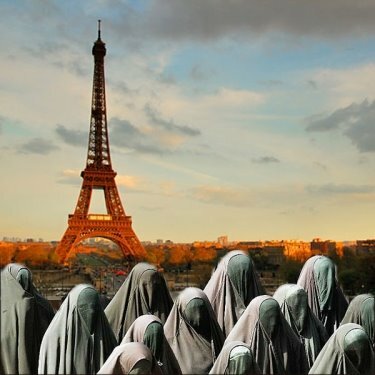 France has also proposed that men who force women to wear the burqa be fined the astronomical sum of 15,000 euros. A Muslim woman has recently been fined 500 euros for wearing a burqa in Italy. Australia has suggested that the burqa be banned as "un-Australian." The Belgians have also voted to ban the burqa. As the author of Woman's Inhumanity to Woman, I am not surprised that the French women came to blows. Many women routinely curse, beat, and mistreat their female servants in developing countries. Wives throw acid at their husbands' mistresses. Mothers-in-law participate in the "dowry deaths" of their daughters-in-law. Co-wives curse, beat, and try to kill each other in polygamous households. Many European women have a very dishonorable history in terms of how they treated women who were Jews, gypsies, "politicals" or homosexuals during the Nazi era. And just because a woman is kept caged in a movable prison does not mean that she cannot and will not exert great aggression towards others. Her passivity applies only to herself in relation to the men in her family. She can be quite aggressive on behalf of jihad and fundamentalism, both verbally and physically. Indeed, this is the only power she has. I expect this horrifying scene in Nantes to be repeated all over the continent.